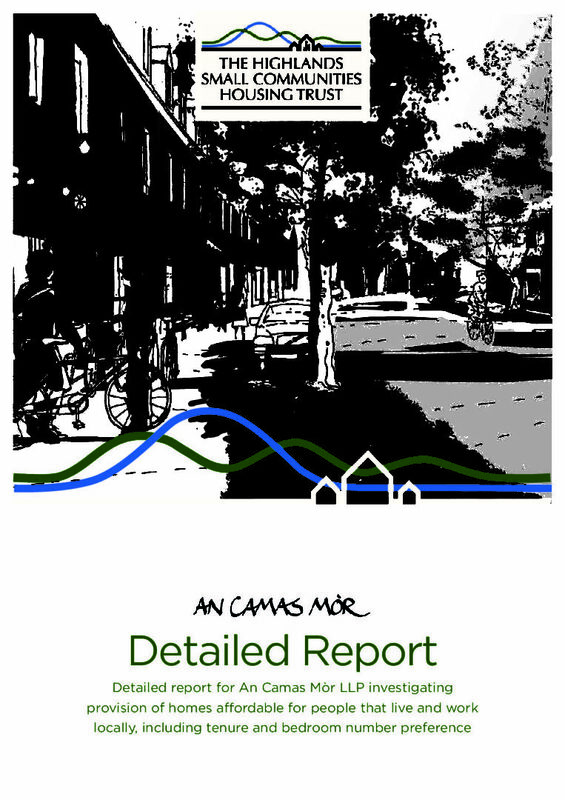 Summary Report for An Camas Mòr investigating the provision of homes for people who live and work locally, including tenure and bedroom number preference. 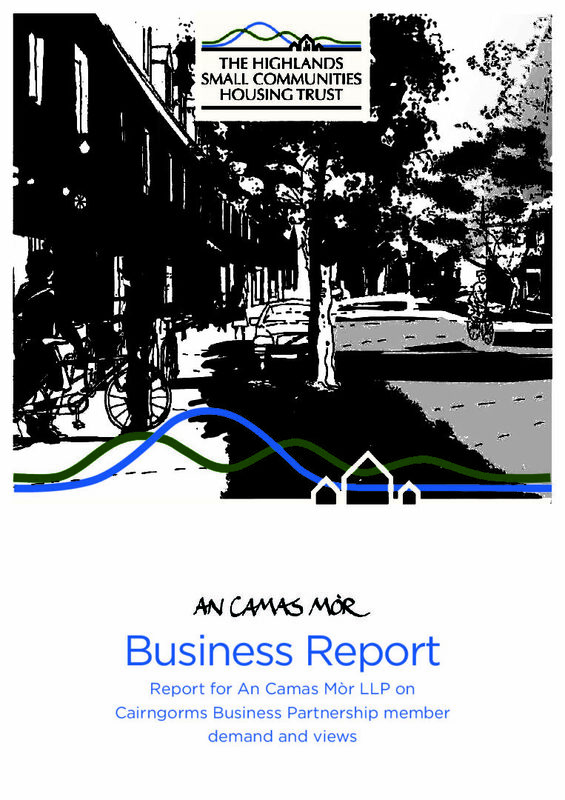 Detailed Report for An Camas Mòr including potential tenure options and future need and demand. Results of Survey of Cairngorms Business Partnership Members investigating the provision of homes for people who live and work locally. The Highlands Small Communities Housing Trust’s survey for An Camas Mòr investigated the provision of homes affordable for people that live and work locally, including tenure and bedroom number preference. 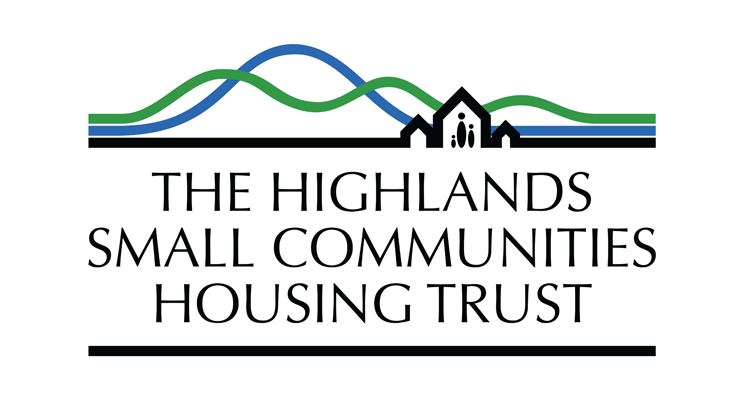 The Highlands Small Communities Housing Trust (HSCHT) is an independent charity that has been serving Highland communities since 1998. Our services can be commissioned by a range of organisations, including community councils, local authorities, local development trusts and businesses for an impartial assessment of affordable housing need informed by our experience in delivering hundreds of affordable homes across the region over almost twenty years. HSCHT has no commercial interests in An Camas Mòr other than being paid for carrying out the surveys. Aviemore and Vicinity Community Council confirmed their support for HSCHT to carry out the work ahead of the survey being sent out. Over 500 responses received to online survey; a very strong response and has provided a significant amount of data to analyse. The survey reached its target of local people interested in living in An Camas Mòr. Strong support for housing for those who cannot compete on the open market, concerns over second and holiday homes (in 2011, 14.9% of homes in Aviemore and vicinity). Results indicate that there will be 135 independent homes required by respondents in the next 3-5 years and the simultaneous business survey identified that local businesses were planning to recruit 86 new staff in the next 5 years. A report undertaken by The Highlands Small Communities Housing Trust, commissioned by An Camas Mòr to investigate the provision of homes affordable for people that live and work locally to Aviemore and its surrounds was unveiled to the public today 9 November 2017.The results of an online survey that attracted responses 520 households. These were analysed to help develop an informed affordable housing strategy for An Camas Mòr based on actual needs. Thank you to the Highland Small Communities Housing Trust and to all those who responded to the survey. Aviemore and the Cairngorms is important to us and to people from around the world. Clearly this report is robust and highlights the need for a wider range of tenure to provide for the needs of people in local jobs. 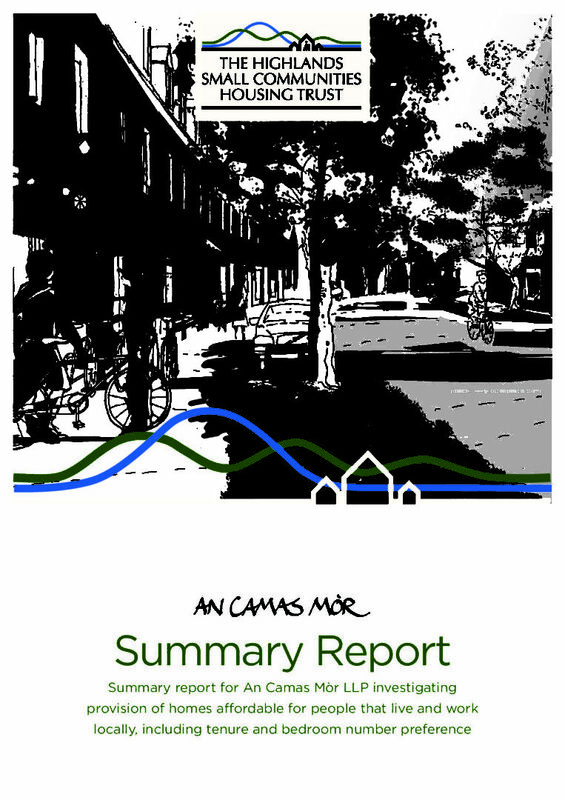 Most importantly its findings are an invaluable source of information that will enable An Camas Mòr, working with public and private partners, to deliver a strategic housing strategy. It’s a factual benchmark of the actual needs of those people living locally as to what the correct housing mix regarding the size of properties, cost and ownership structure should be. The findings are a significant step on the way towards delivery of a planned community that will inspire and enable us all to look after this amazing area; by working with the help of Gehl Architects together we have a once only opportunity to make Aviemore and Vicinity a place in which all Scotland can be proud. We look forward to studying the report, receiving further information from the public and public bodies and will follow that up with the preparation of the Housing Strategy for consultation and submission to the Cairngorms National Park Authority. An Camas Mòr was included in the Local Plan to start from 2005. With agreement with the Authorities the first application was submitted in 2009, no further information was sought and permission was issued in 2014. An Camas Mòr LLP applied for renewal of the Planning Permission in Principle in February 2017; it was determined on 18th August and we expect to receive the determination notice in the next two months; then we should be able to review the delivery programme with the public sector and other stakeholders. The plans were awarded Scottish Sustainable Communities Initiative exemplar status by the Scottish Government and we hope that recent developments will enable the vision to become reality, to help the local people of Aviemore and Vicinity to have access to a range of affordable homes suitable for their needs as well as providing space for community services, recreation and diversification of employment.